Last weekend, Mom and I took a few days off and headed to Chicago. It had been 10 years since our last visit and on that visit we planned poorly and weren’t prepared for their chilly April weather. It rained a lot, too. 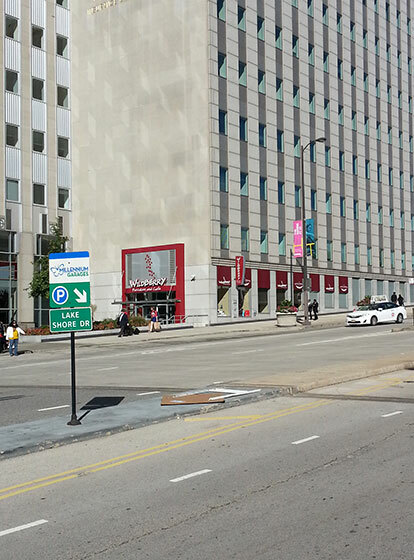 So it was time to let Chicago redeem itself and did it ever. The weather was gorgeous all four days that we were there. Since we had visited the museums and aquarium on our last visit, we skipped those and opted for the tours this time. We also ate ate ate. 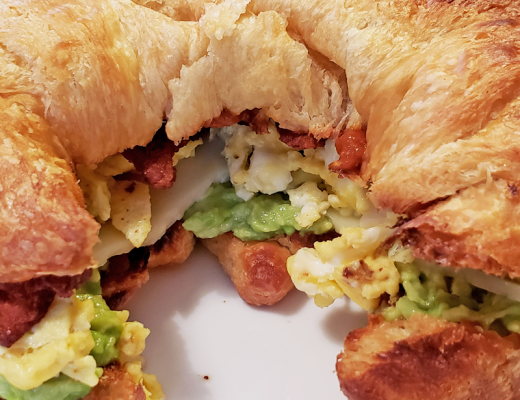 I made a list of all the restaurants and bakeries I wanted to try…but we only managed to hit one on the list. Our dining choices were really spread out and so we ended up flying by the seat of our pants for most of our meals. 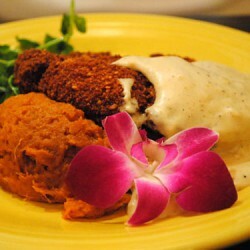 While it wasn’t the culinary cream of the crop I had planned, we had great food the entire time. It just means I need to go back to mark more restaurants off my list! Our first stop was the only restaurant on my list. Deep dish pizza of course! Gino’s East was a short walk from our hotel and we headed there for lunch as soon as we landed. 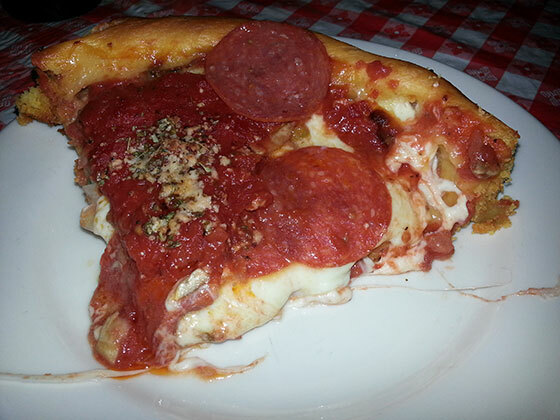 We ordered a small of the Gino’s East Supreme with pepperoni, onions, green peppers, and mushrooms. It was awesome. I’m still a NYC pizza girl at heart, but I gobbled this one up. Two pieces and we were stuffed. The crust wasn’t as awesome as I’d hoped, but the rest of the pizza was really tasty. I loved the little sprinkling of Parmesan and herbs on the top. 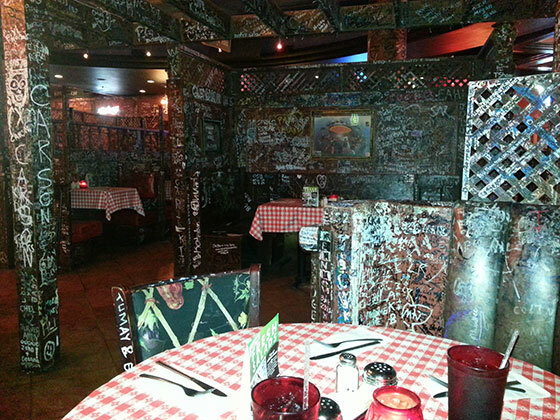 The inside of Gino’s was really interesting. It was like being inside a haunted house. Very dark and graffiti was everywhere. 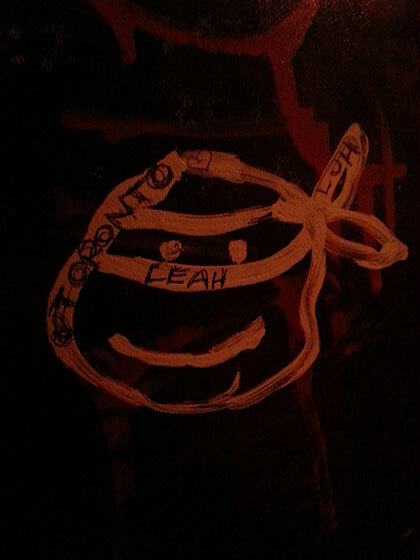 I had to write my name, of course, so I found this Teenage Mutant Ninja Turtle on our booth and left my mark on Gino’s. After pizza, we wanted a sweet treat (yes, we still had a bit of room left!) 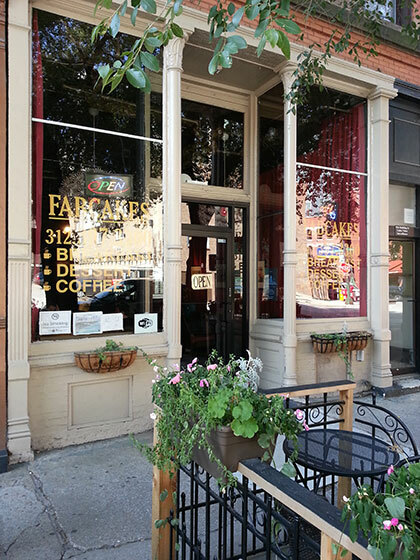 and walked just a bit further to find Fabcakes. 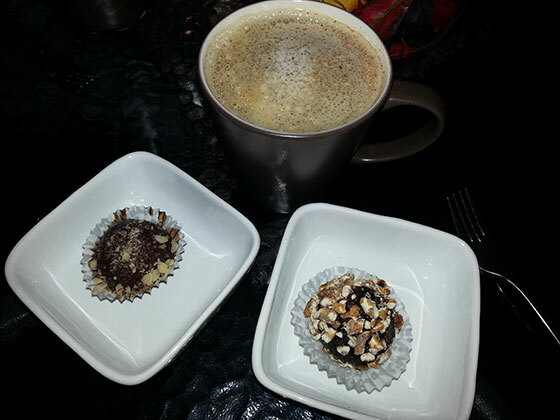 We both ordered a Cafe au Lait and decided to share two bonbons, one was Brownie Pretzel and the other Nutella. The coffee was perfect with just a touch of cinnamon on top. The bonbons were just ok for me. The brownie pretzel had a too dense texture and the pretzels weren’t crunchy. It wasn’t as chocolately as it appeared and actually kind of flavorless. The Nutella was much better texture-wise. Softer and what you’d expect from a bonbon. Not too sweet, but just enough to satisfy a sweet tooth. They also serve breakfast and lunch. Seeing as it was Saturday night and there was Alabama football to be watched, we wanted to find a place for dinner that would have the game on. We ended up at Rudy’s Bar & Grille. It’s a long bar when you walk in with huge TVs. They were nice enough to turn the Alabama game on for us, so we sat at the bar. I wasn’t all that hungry and ordered The Wedge. 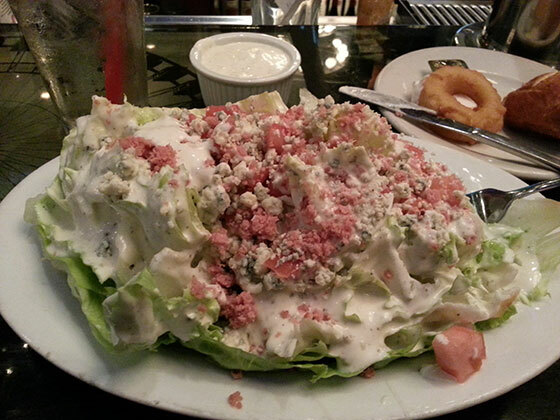 It’s a wedge of lettuce, diced tomatoes, crumbled blue cheese, bacon crumbles, peppercorn dressing, and topped with an onion ring. I also ordered extra dressing on the side since any wedge I’ve ever had comes with a drizzle. Yeah, no, they load theirs up with what appeared to be an entire bottle of dressing at Rudy’s. It was unfortunate because the dressing was absolutely delicious. Every single ounce of this ginormous wedge was swimming in dressing. I ate what I could and then called it quits. 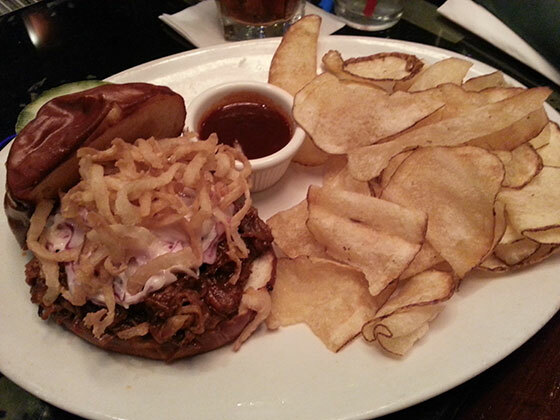 Mom ordered the Pulled Pork Sandwich which was slow roasted pork, purple slaw, a drizzle of homemade BBQ sauce on a French roll. It came with homemade chips that were pretty awesome. Mom said the sandwich was really good. It was a good place to catch the first half of the game, but our bartender was apparently the most miserable person in Chicago that night. 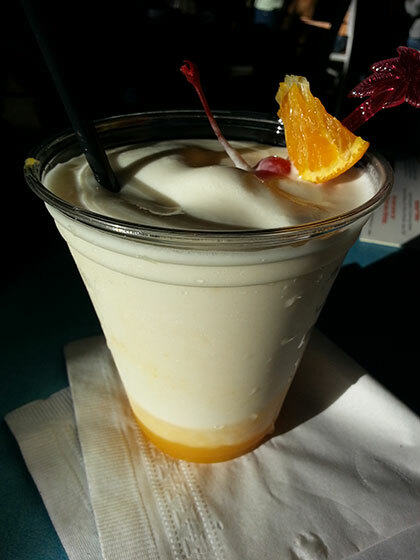 Rudy’s is the home of the Milkshake Martini and when I asked her about it she grumbled, “it’s a milkshake with booze.” Not the best service we’ve ever had as she was pretty grumpy the entire time. We only stayed for the first half because the lights went down and the music went way, way up. I hate to sound like an old lady, but I think even a teenager would agree it was crazy loud. That was our cue to head back out to being a tourist. The next day for lunch we found ourselves at Wildberry Pancakes and Cafe. This place was hoppin’! We were in the mood for a big, juicy burger and once I spotted that Harvarti was on top, I was sold. We both ordered the Seared Applewood Bacon & Harvarti Burger. 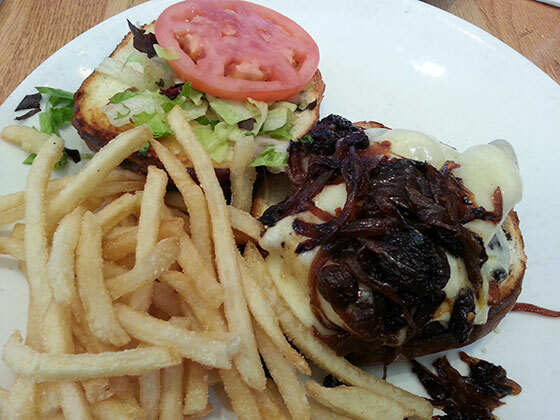 Freshly ground Black Angus burger topped with creamy Havarti cheese, Applewood smoked bacon, caramelized red onion marmalade on a pretzel bun. Y’all. This burger was amazing. Harvarti melts so beautifully and they that red onion marmalade was to die for. It was tangy with a bit of sweet. It had raisins and what I guess to be figs or dried plums in it, too. So crazy good! While we were enjoying our burgers, we noticed everyone around us ordered breakfast food. Hmm, a second visit might be in order. 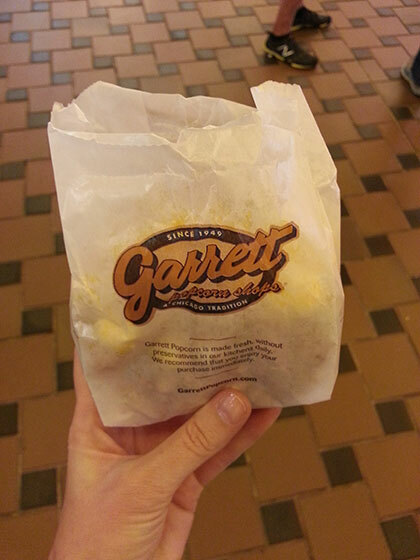 Just like their pizza, Chicago is known for Garrett Popcorn too. And I can taste why. It’s like crack. 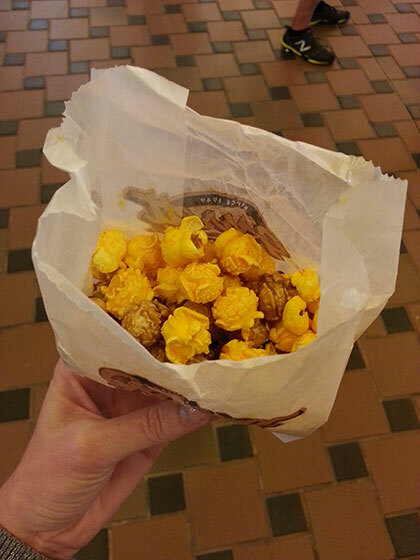 We got a sample of The Chicago Mix and it’s half CaramelCrisp, half CheeseCorn. Which sounds gross, but it’s perfect. Salty and sweet! We inhaled our sample bags and the next day bought a small (which is ginormous!). They not only gave us our small, but two more sample bags! I ate that stuff like it was my job! The sticky, orange popcorn fingers are totally worth it. Later that night we went to Howells & Hood for dinner. I was so excited about this meal. It’s in the bottom of the Tribune Tower and we checked out their menu earlier. All I could think about was risotto and dessert. It’s named after John Howells and Raymond Hood, the architects of this gorgeous tower. I ordered the Wild Mushroom & Pea Risotto with seasonal wild mushrooms, English peas, wild arugula, sheepâ€™s milk Parmesan, and brown butter. Good Lord it was heavenly. 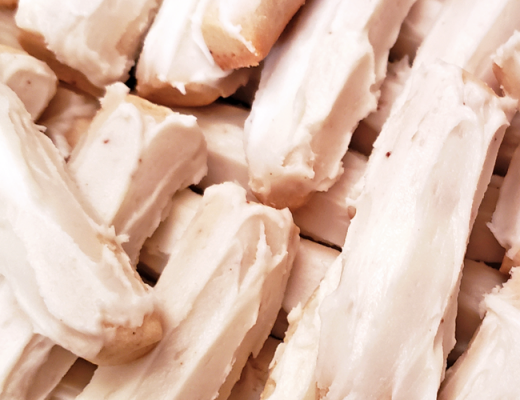 So decadent, so creamy, so perfect. The one thing I hate about vacationing is that you can’t really take home leftovers. I was getting so full and was determined to have dessert, so I had to let half of this dish go. It was a huge serving, but man I hate throwing away fabulous food! Mom wasn’t as hungry and ordered the Potato Pancake appetizer. Thin potato pancakes served with a tart applesauce. She said it hit the spot. Their dessert menu was the toughest to narrow down to one. We decided we were too full to share two. 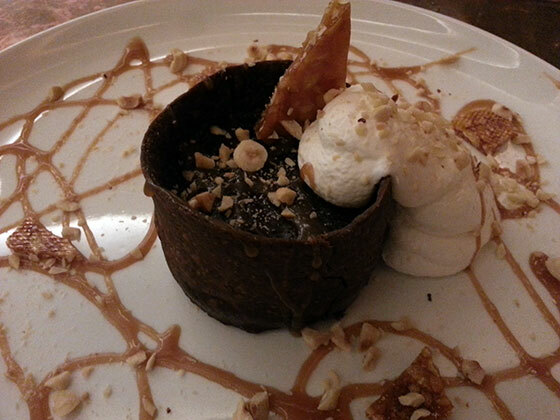 We finally settled on the Chocolate Hazelnut Tart. It had a chocolate crust, chocolate souffleÌ filling, hazelnut praline, candied hazelnuts, Frangelico caramel drizzle, and whipped cream. It was just what we wanted. 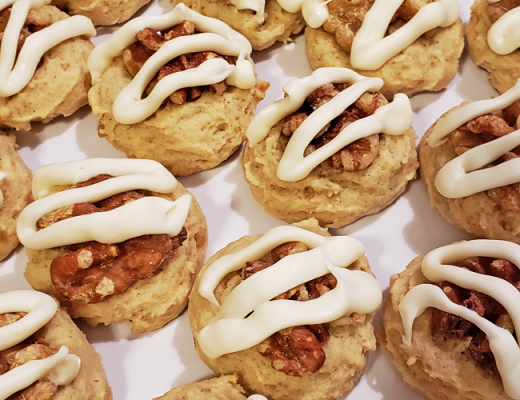 Sweet and crunchy and delicious. The Peanut Butter Snickers Pie got rave reviews from our waiter, so I wish we’d had room to order a second dessert. I really wanted to try the Beer, Bacon, and Pecan Tart, but our waiter didn’t give us positive feedback on it. How can you go wrong with that combo? Well, look who made a second visit to Wildberry! It is extremely rare for me to visit the same place twice when I’m on vacation, unless it really really knocks my socks off. After seeing all those folks around us order breakfast when we were chomping down on our burgers, we knew we had to come back. I’m so glad we did! 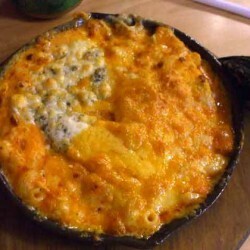 This round we decided to split the Venetian Sizzlin Skillet. These skillets are huge! 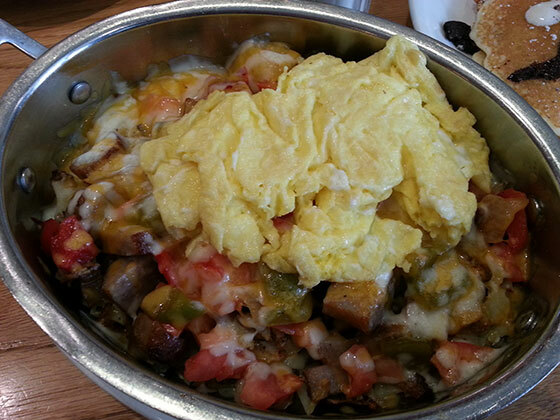 It starts with mounds of potatoes, topped with sausage, bell peppers, onions, and tomatoes. Next comes Monterey Jack and Cheddar cheeses. Then two eggs cooked any style you like, we opted for scrambled. (Oh my gosh can you imagine with a runny egg?!) With that you get your choice of pancake or toast, so of course we went pancake. For a $1 upcharge, you can get one of their specialty pancakes. Hello Oreo S’mores! 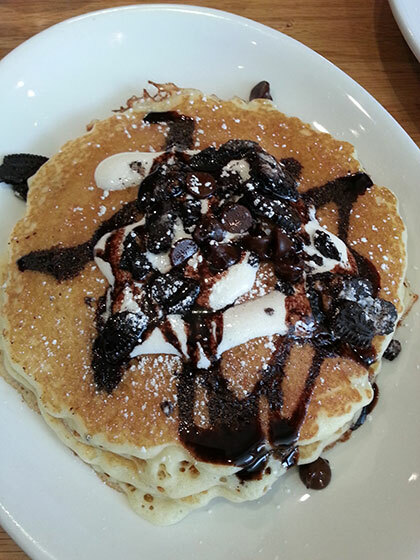 Buttery pancakes stuffed and stacked with marshmallow spread, chocolate chips and Oreo cookie crumbs. Their menu is incredible. 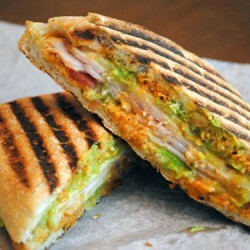 I want to book a flight to Chicago just to eat here again. Ok, time to take off your judgy food hat. I went way off the grid on my usual ways when it comes to eating on vacation, but it actually turned out quite nicely. 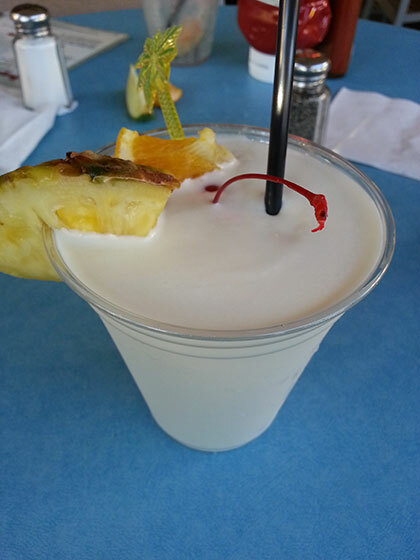 First, we stopped at Margaritaville. I know, I know! But we were walking on Navy Pier and had been walking for what seemed like forever. 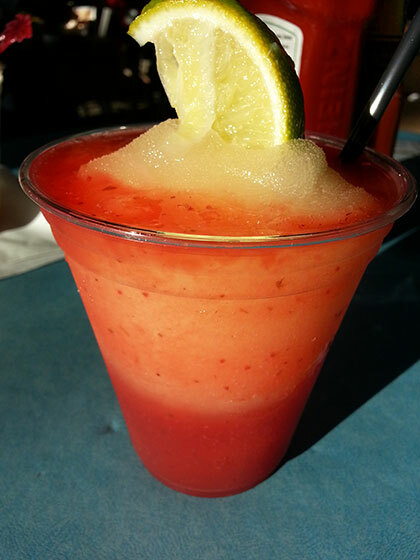 A good margarita sounded like the best thing ever, and hey they make pretty damn good ones at Margaritaville. So I broke two rules. One, no chains, and two, no restaurants that exist at home. Two drinks in and we really didn’t care. 😉 You’re looking at the Tropical Fruit Margarita with Strawberry, the Bama Breeze, and the Euphoria Daiquiri Pina Colada. Our last stop was…brace yourself…Cheesecake Factory! Say what? Yeah, sue us. We couldn’t resist going here and breaking my rules one more time. This particular Cheesecake Factory has sentimental value though. 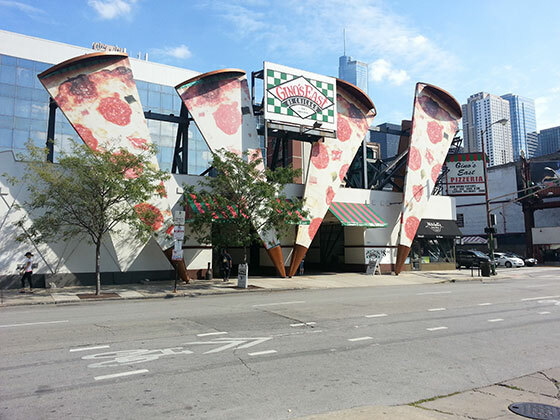 10 years ago when we first visited Chicago, I was no where near the snobby restaurant goer I am today. We didn’t do any food research beforehand back then and smartphones didn’t exist. We found ourselves at the John Hancock Center and guess what’s below it? Yep, Cheesecake Factory. We had never heard of it before and loved it. We loved it so much and found it so easy that we pretty much ate every meal there for the rest of our trip. Talk about coming a long way since then! We thought it would be funny to go back. We initially wanted just a slice of cheesecake but ended up eating dinner there. I had a Caesar salad and Mom had the regular salad. Of course both were big enough to feed the entire state of Illinois. 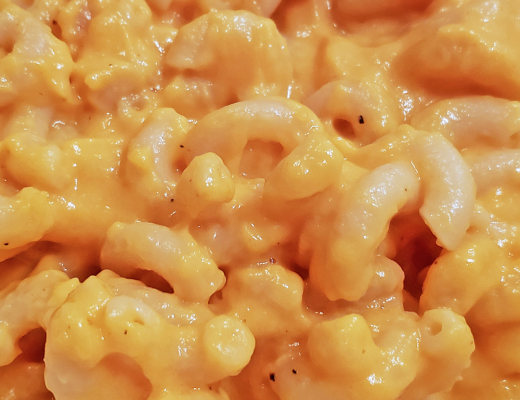 We also tried their fried macaroni and cheese. Mom liked it, I thought it was too greasy and salty. We had eaten so much all day and the fried cheese put us over the edge. So no cheesecake. But we did get to reminisce about that first trip. And yes, it still looks like you’re trapped in a pie on the inside. Even though it wasn’t the culinary adventure I expected, we still pigged out and had a great time. I’ll have to go back soon to check out the awesome restaurants we missed. I could spend months there and never get them all in. It’s definitely a town for food lovers. Stay tuned for my post on our sightseeing adventure! Wildberry looks fantastic! Will definitely be adding that to my rather lengthy list of where to eat on my next visit. And now all I’ll be thinking about allllll day long is that ridiculous and addictive popcorn. SO. GOOD. 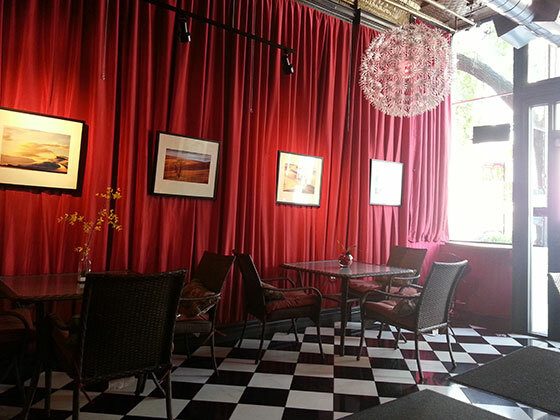 Wildberry was amazing and it’s right across the street from Millennium Park. That popcorn IS crack. I’m totally ordering some. It’s even good stale, lol! 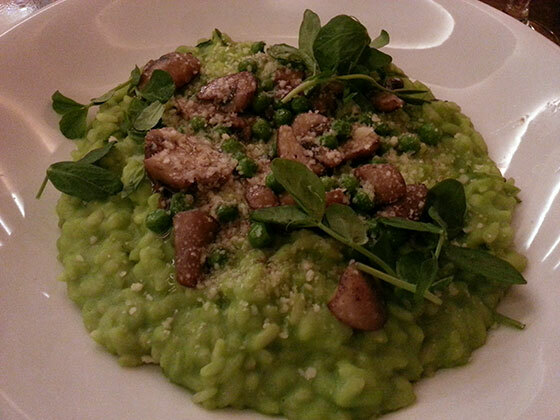 I don’t know much about Howells and Hood, but after seeing that pic of the mushroom and pea risotto, I want to go right now! 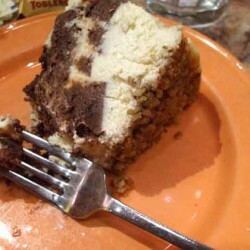 And, you know, I won’t go to a Cheesecake Factory when I’m traveling (since we have one), but I admit the food is good. And it was about 12 years ago that the ones in Atlanta and Las Vegas were planned destinations for me. mmm…cheesecake. OMG, that risotto was just perfection. I admit the cheesecake at Cheesecake Factory is spot on. Their lemon raspberry rocks my world. The food I could take or leave it. Glad I’m not the only one with chain skeletons in the closet, ha ha!